She originally trained as a chartered accountant with Peat Marwick Mitchell & Co, then worked in insolvency at Arthur, Young, McLelland Moores & Co and Corporate Finance at Ernst & Young. She has also worked at the London Stock Exchange. 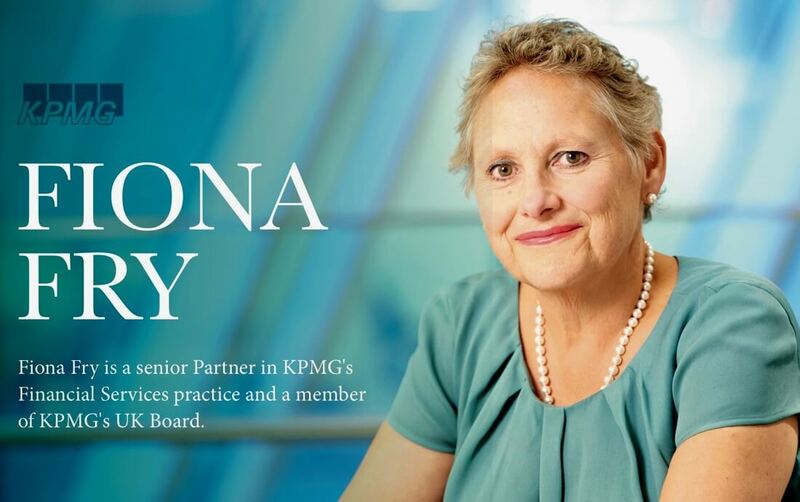 Fiona has been involved in consumer related regulation for over 25 years, including a role as Head of Investigations at IMRO and then the FSA, before joining KPMG as a Partner in 1999. During her time as a regulator, Fiona led many reviews and investigations. She led IMRO’s work on the pensions transfer issue and the investigation into the Morgan Grenfell/Peter Young issue. Fiona leads KPMG‘s Financial Sector Centre of Excellence and, since taking up Partnership at KPMG, she has played an integral part in KPMG’s Retail Financial Services work. She headed up KPMG’s approach to Treating Customers Fairly (TCF), leading two of the biggest TCF transformations in the insurance sector. She also led KPMG’s Retail Distribution Review work until the end of 2010. Over her time at KPMG, Fiona has led numerous reviews of miss-selling and related controls issues in banks, insurers and fund managers, including many section 166 reports. Fiona speaks regularly on such matters, including for the BBA and ABI. Speaking about her recent appointment to head the Centre of Excellence, Fiona believes she has very large shoes to fill. ‘I am doing something women often don’t do because I am coming in as a leader rather than a deep technical expert. I am very enthusiastic about it and want to make it work. Besides the people in the group are lovely and I want to support them and be a good leader. There have been 2 or 3 moments in my career when I have been given the opportunity to do something which is a massive challenge and have taken it every time. I have been very lucky in those moments to have great bosses who have let me get on with it and have my back. is has enabled me to get over the Imposter Syndrome. You need people to have faith in you and have no doubts that you are capable. I had this and it transformed my life and made my confidence flow.’ A Woman’s Problem? ‘Diversity is clearly a problem if you look at the numbers specific organisations have. In some places it can appear we have the right trajectory, but many still don’t. It has become one the biggest issues for women, because if we can’t even get them on to boards then there is no diversity at all. It’s not just about gender either. All groups need to be represented, we need diversity in backgrounds too. Women are great at looking for and solving problems because they have had different life experiences and boards miss out if they don’t have this. What we bring to the table is important. We have different ways of viewing a situation, and have a different way of looking at how an organisation works. Typically women are more sympathetic too. Men can be generalists. Having women in senior roles sends a message throughout the organisation that women matter and encourages women into the pipeline. Women will do very well if they allow themselves to. What they need is encouragement and empathy. I have personally mentored some from graduate through to partner, this is very rewarding as I have a true interest in them throughout their career. Women are naturally nurturing and we should be proud of this. I believe there are many styles of leadership and women make strong delegators that don’t micromanage. We build trust and always rise to the challenge. I think the trouble is that so many are waiting for the chance to lead yet lack the opportunity. Women have to work harder at being more direct when dealing with people, usually we try to please people which is our nurturing side. We have to be direct without losing our leadership style. It is interesting that when hiring women naturally look more broadly over the talent pool, while it is easy for men to reach for the person they know well and feel comfortable with, which is often another man. Attracting good people is all about the brand you have, the team you already have and the leadership style. The best advertisement for your organisation is people being enthusiastic about working there and encouraging others to join. When it comes to retaining top talent, the thing I do that keeps people is to be 100% honest, all the time. You can’t always promote people, sometimes there are not ready. I don’t believe in keeping people dangling as to whether they are going to be promoted or not. I think this is dishonest and lazy. I tell them honestly and how they can improve their work so that next time they will have a better shot at it. I take time to talk it through on how they can promote themselves within the company better. It is important to spend time with people to get the best out of them. The organisations that get it right take the time to nurture people continually, making it part of their process creates a confident working environment because they know the company has their back. Also I push people hard to find opportunities for themselves and to stop depending on others to get them up the ladder. It is a supportive approach with the right coaching at the right time. I think women should just take the opportunity and go for it. If you have a good boss who is a good leader this will be easier. But if you don’t, and I have had a few shocking ones along the way, then you just have to get on with it and stick with it. There is no substitute for working hard.